On a scale of 1 to 10, how much would you say you hate pigeons? 11? That’s what most Americans would say. However, there are places in the world where this obnoxious little bird that we so readily dismiss as a pest is sold by farmers and grocery stores as the greatest delicacy to be enjoyed. In the U.S., a great amount of effort goes into dealing with pigeons and their “byproducts” (i.e. excrement). Have you paid attention to those little thorns on the ledges and cornices of New York City buildings? They are there precisely to keep these birds from hanging out on our building facades and covering them in poop. Billions of dollars are spent every year by cities and the bird-control industry cleaning up pigeon excrement in an effort to avoid the spread of the many diseases carried by it. Never mind that the incidence of said diseases is next to null in our country. Meanwhile, many people across the globe consider pigeons an important source of protein. In Great Britain a bird may cost as much as $7,80 or $9,40. Many soup and roast recipes can be found on the Internet with suggestions as to how to best prepare it. 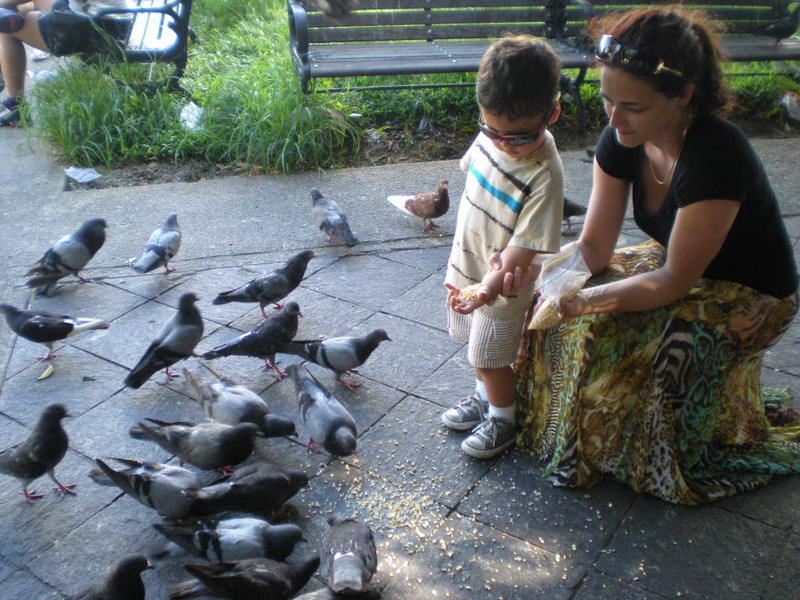 People are also fond of memories with their children feeding pigeons in the park in places like Latin America, London and Namibia. In Puerto Rico, there is even a “Pigeon Park” in Old San Juan with a wall full of pigeon holes where the birds live and where people are encouraged to buy bread and corn to feed them. 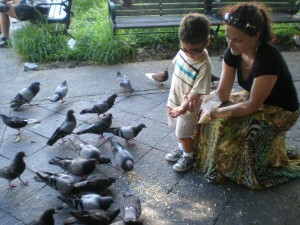 Kids stand in for pictures while dozens of pigeons stand on their arms and head!! So, what would it take to have you sit of a pigeon stew? This entry was posted in Ask a Question and tagged children, delicacy, food, gourmet, park, pigeons. Bookmark the permalink.